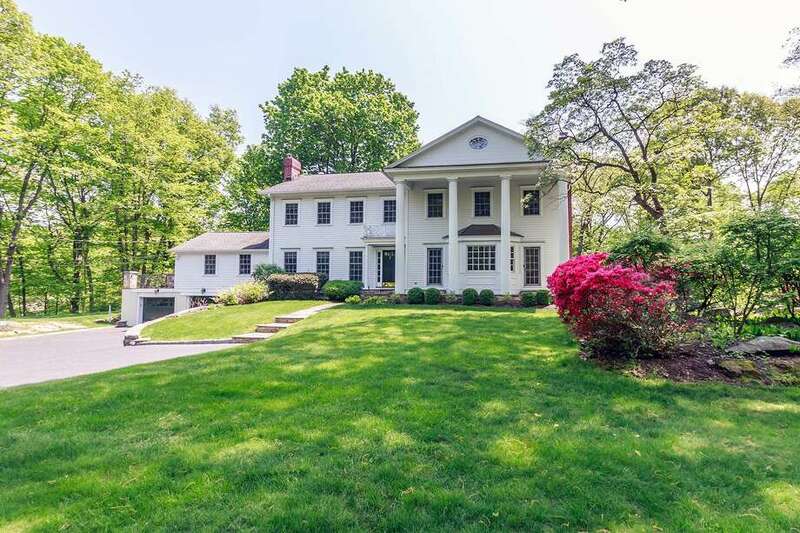 The stately colonial house at 46 Delafield Island Road is perched atop an attractive knoll in the private Delafield Island Association. DARIEN — The stately colonial house at 46 Delafield Island Road is perched atop an attractive knoll in the private Delafield Island Association. This private residential enclave and the neighboring Tokeneke Association are known for their glacier rock terrain and ledges. The position of this 3,664-square-foot house, high on its 1.66-acre level and sloping property, gives it a bird’s eye view of its surroundings and enhances its privacy. And yet, this location gives its homeowners easy access to town amenities. This property is within walking distance to Tokeneke Park, Tokeneke Beach and Tennis Club, and Pear Tree Point Beach on Long Island Sound. Tokeneke Elementary School is less than a mile away. The house is not far from the town center and the Metro-North train station, and the Rowayton section of Norwalk is also close by. This white clapboard house was built in 1957, and was more recently updated. Several rooms have doors to the attractive grounds encouraging indoor-outdoor living, which is ideal in this setting with its carpet of lawn, attractive landscaping and gardens, terraces, and thick border of tall, mature trees. As one travels up the driveway, the dramatic front facade with its four two-story fluted doric columns comes into view. Columns are found inside as well, although they are the more ornate ionic style. Two stand in the entrance between the two-story foyer and formal living room and the other two in the entrance into the formal dining room on the opposite side of the foyer. Both of these rooms and the foyer are framed by dentil crown molding. The living room features a red brick fireplace with a decorative white wood mantel and two separate doors to the colonnaded front porch. French doors lead from the living room into the office, where there are sliding doors to the side yard. Two separate doors in the dining room lead to the raised patio and backyard. It also features chair railing with egg and dart molding detail, and two built-in corner china cabinets. In most houses, the kitchen is the heart of the home. That is true of this house as well, although this gourmet eat-in kitchen is even more comfortable than most. Unlike most kitchens, it has a fireplace. This kitchen was renovated by Deane in 2015 and features a center island with a prep sink, wine refrigerator, and breakfast bar for four or five. It also has quartzite counters, a built-in desk area, and high-end appliances, including a six-burner Wolf range and Sub-Zero refrigerator. French doors separate the kitchen from the spacious family room where there is a gas-burning stove, cathedral ceiling, exposed beams, ceiling fan, a wall of built-in cabinetry and shelving, and French doors to a slate terrace with a wrought iron railing above one bay of the attached three-car garage. An inlaid darker wood border encircles the room. As with the first floor, the second floor has nine-foot ceilings. There are four bedrooms on the second level. In the good-size master suite, there is a walk-in closet and the bath features attractive built-in cabinetry in two contrasting wood stains, two separate vanities topped with granite counters, a large shower and jetted tub. There will be a public open house on Sunday (Dec. 2), from noon to 4 p.m.
For more information or to make an appointment to see the house contact Nellie Snell and Robin Argiriou of Al Filippone Associates/William Raveis Real Estate; Snell at 203-979-9149 or nellies@afahomes.com, and Argiriou at 917-748-1337 or robina@afahomes.com.